The image resolution is same as the Full version Dagik Earth DVD. The number of contents is limited to reduce the files size about 2GByte. For setup 4GByte disk space is required temporally. Appli to browe local HTML files such as "HTML Runtime" is installed. Here we use "HTML Runtime" as the browser. With PC, open this page（ http://earth.dagik.org/dow/offline ）, and download zip files English version: Dagik_HTML_select-english-201507.zip or Chinese version: agik_HTML_select-chinese-201507.zip . 3-5. Drag & Drop the zip file to "HTML Runtime Documents"
From "Setup" of iOS, select ”HTML Runtime” and set "Scale page to fit" and "Open cotinulation page" off. Start ”HTML Runtime”. Wait for unzipping at the first boot. and "Firefox" as the web brower. 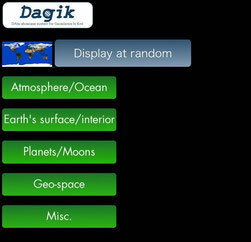 With Android device, open this page（ http://earth.dagik.org/dow/offline ）, and download zip files English version: Dagik_HTML_select-english-201507.zip or Chinese version: agik_HTML_select-chinese-201507.zip . Start "Y! file manger", open "Download" folder, and unzip the downloaded zip file. Open "index.html" in the folder extracted from the zip file. Use "firefox" as the web browser.